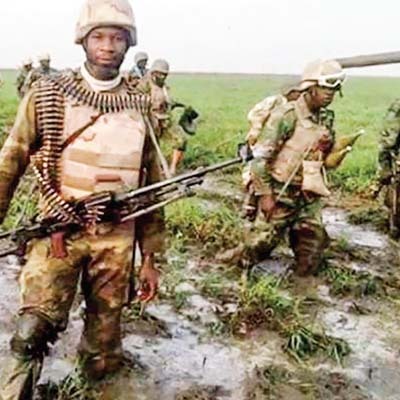 The Nigerian Army, yesterday confirmed the killing of 42 Boko Haram insurgents during a mass raid at Garere village in Kukawa Local Government Area of Borno State. This was disclosed by the army spokesman, Col. Sani Usman in a statement issued in Abuja. According to him, 80 hostages, comprising 38 women and 42 children were rescued during the operation. The operation which took place on Tuesday evening followed a tip off on the camping of the insurgents in the area. The team also recovered 504 rounds of 7.62mm (NATO) ammunition; 162 rounds of 7.62mm (special) ammunition; one Land Cruiser Sport Utility Vehicle (SUV), 34 Jerry cans of PMS and AGO. “The operation tagged “Operation TIGER CLAW” followed intelligence report on the convergence and massing up of dislodged Boko Haram terrorists at Garere village. Usman also stated that the insurgents were planning an attack on isolated areas in the community. “The intent was to carry out attacks on some isolated communities but troops on fighting and clearance patrol Code-named “Operation TIGER CLAW” on Tuesday swooped on the terrorists. He stated that the women and children were taken to a military health facility for checks, disclosing that intense vigilance and pressure are being mounted on the insurgents in the area. Family of Oniba of Iba kingdom, Oba Goriola Yishua are still worried over the silence of his kidnappers who are yet to establish contact with them. Oba Oseni was last week Saturday whisked away by gunmen. Two persons, including his police orderly were shot dead while his fist wife and several others were injured. His son, Major Akeem Oseni yesterday confirmed that no contact has been established between the family and the kidnappers. Spokesperson of the police in Lagos, Dolapo Badmos said the police had been having sleepless nights following the kidnap saga. Meanwhile, the Lagos State Deputy Governor, Dr. Idiat Oluranti Adebule, has appealed to the abductors of the Oba oseni, to ensure his safe release. Dr. Adebule made the appeal yesterday while addressing journalists on the ugly incident. Adebule who was optimistic that the oba would be re-united with his family and subjects, noted that as custodians of traditional norms and institution, royal fathers deserve honor and respects from all the citizens. She stressed that the state government was working hard with various security agencies to ensure safe rescue of the Oba Oseni. She appealed to the kidnappers to remember that the monarch has various duties to perform in ensuring peace and tranquillity in the town. Adebule also urged law enforcement agencies to step up their duties and ensure that the monarch is rescued unhurt. She also appealed to Nigerians and people of Lagos State to support and assist the police command with useful information saying the State government will continue to sensitize the public on security issues and give necessary support to law enforcement agencies as they work to secure the lives and properties of the people.